A new limited edition IWC Portuguese Yacht Club Chronograph built to commemorate the 2011-2012 Volvo Ocean Race, dubbed the "Everest of Sailing has been officially launched in Spain. 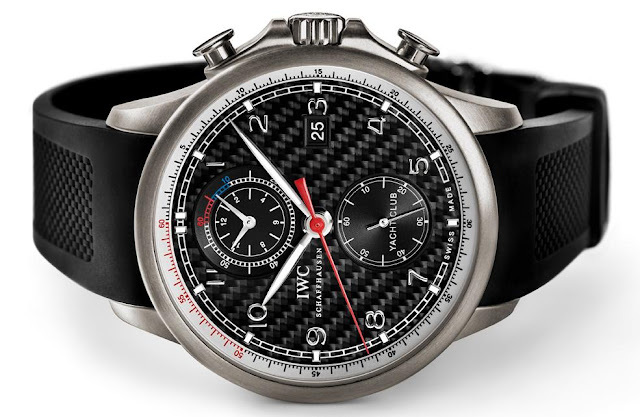 The race winners will each receive the water proof chronographs especially built for yachting, and it’s the first IWC Portuguese chronograph to be built in titanium. In another first, IWC is the Official Sponsor of the Abu Dhabi Ocean Racing team, and makes its debut in team sport. It's probably the toughest and most spectacular of all offshore races. The Volvo Ocean Race gets under way with the In-Port Race at the Spanish port of Alicante and takes in six continents and four oceans before the crews tie up for the last time in the summer of 2012 in Galway, Ireland. In the course of the voyage of 39,270 nautical miles (72,728 km) through some of the world’s most treacherous waters, the crews can look forward to extreme challenges and adrenaline rushes in their battle against ice-cold storms, 15-metre-high waves and spirit sapping calms. The 11-strong crews will be living on minimal sleep, with virtually no privacy and on nothing but freeze-dried meals. 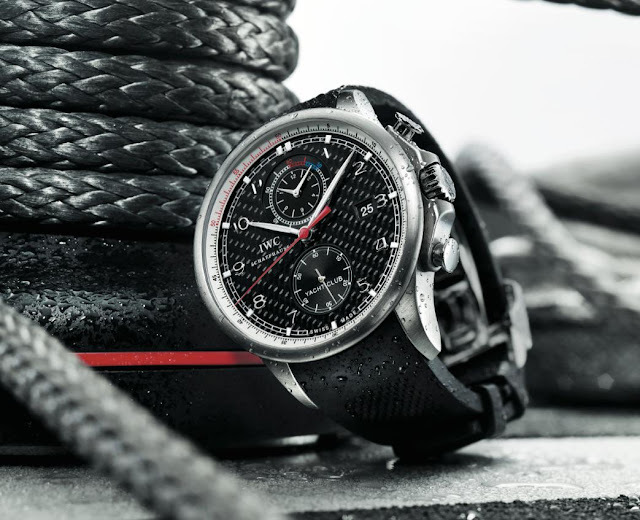 The IWC Portuguese Yacht Club Chronograph Edition "Volvo Ocean Race 2011–2012"
This functional, reliable and elegant sports watch is made for the first time of titanium. With water-resistance to 6 bar and a screw-in crown with crown protection, the watch is equipped with the IWC-manufactured 89361-calibre movement with a full 68 hour power reserve, is a robust and advanced chronograph movement, and features a fly back function as well as an analogue display with two hands in a sub dial for long stop times. 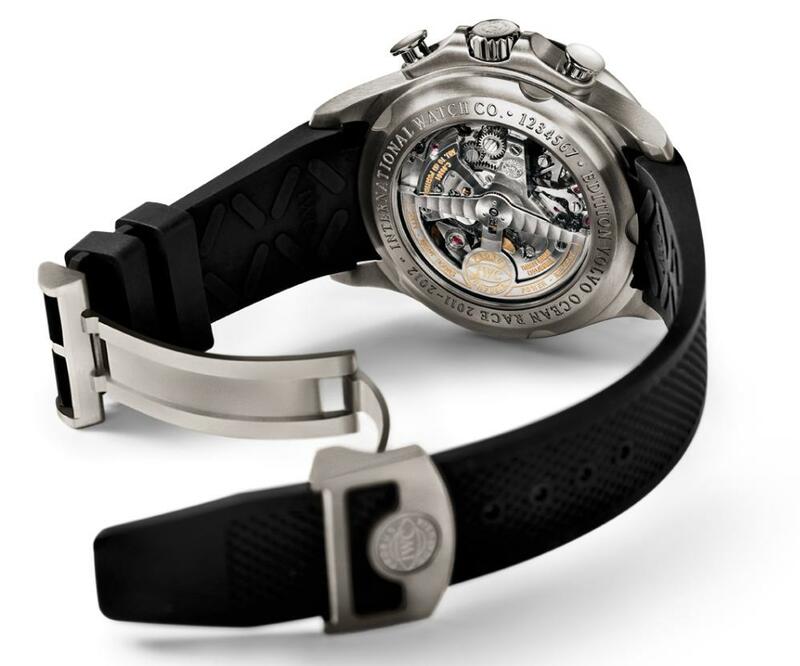 The watch comes on a black rubber strap with a folding clasp. Luminescent hands and indices combined with the 45mm dial, give the new IWC Portuguese a commanding and contemporary design.